NON-STOP ADVENTURE FUN!!! Morning Session. We’ve just finished up another fabulous week of Non-Stop Adventure Fun!!! 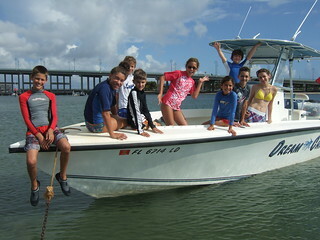 As usual, we started the week out with another great group of kids looking for Fun and Adventure on the lake worth lagoon! And before you could say lickety split twelve times, we were having it and the time of our lives!!! Group on the Dream Chaser. We had manatee and dolphin encounters from the very start. By the end of the week, we had found and caught lobsters, barracudas, bonitas, all kinds of crabs, 4 different species of starfish, 5 different species of sea urchins, striped burrfish and long-spined burrfish, pufferfish, pipefish, filefish, blennies and some Big lane snappers to name just a few! We had a blast snorkeling the Rock Garden, Peanut Island, the Big Sandbar and around Munyon Island. 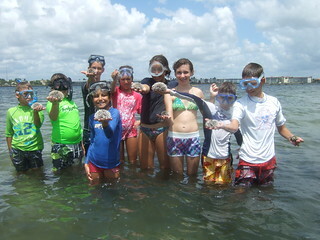 We had a ball collecting sea urchins and west indian sea eggs by the handfuls!!! Needless to say, we were busy having FUN from start to finish!!! We trolled plugs for barracudas along the sandbar and inlet while we went slow, and every now and then, a big one would take the lure. 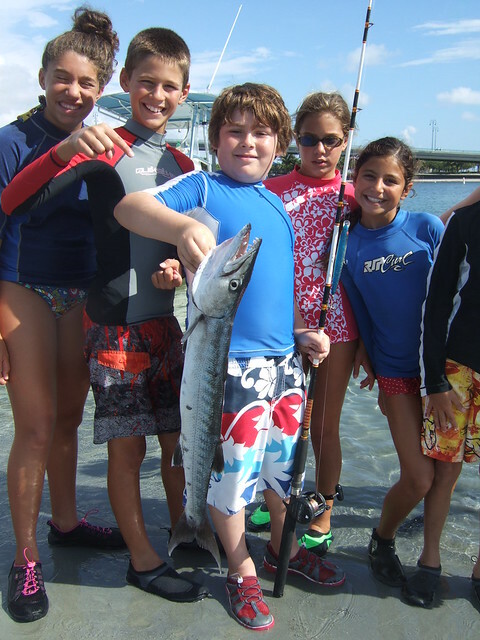 On this day, Max had Fun fighting and reeling in this nice barracuda. Way to go!!! 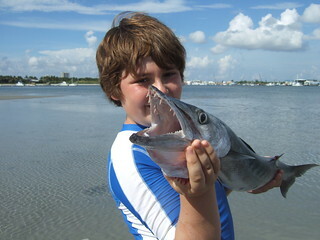 Max catches a nice barracuda. Another morning the ocean was flat calm and we ran out a little bit to look for sea turtles and what ever else we might find. Before you knew it, we were in a weed line watching turtles lounge on the surface around us and flying fish scatter just off our bow! We put out the line, and a few seconds later, Max and Ethan had some nice bonitas in the boat! It was great fun watching them reel those hard fighting fish in! Nice job!!! Ethan catches his first bonita. Another day we stopped by sea urchin shoals and collected sea urchins by the handfuls! 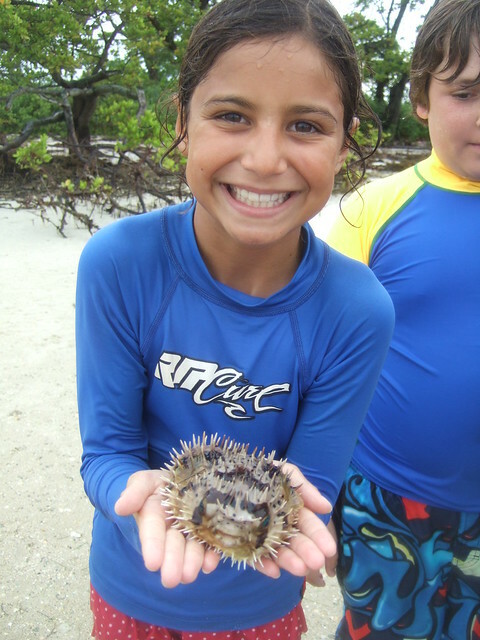 We found variegated urchins, reef urchins, west indian sea eggs, a few pencil urchins and a couple of realy nice, long spined urchins that I carefully picked so they could get a better look. 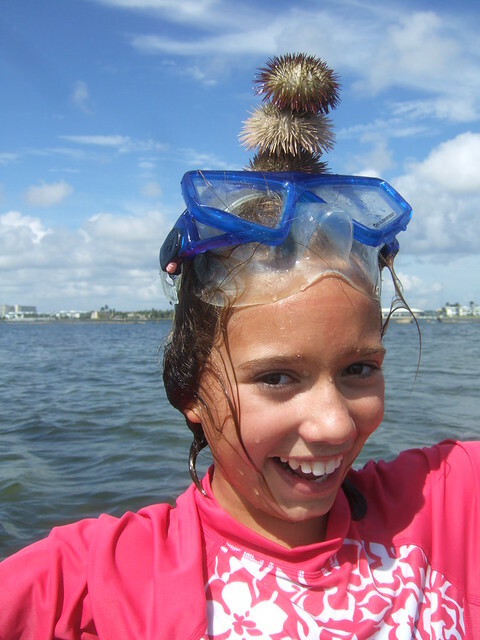 It was cool watching Dahlia, Davina, Julia and Michaela balance the short-spined sea urchins on their heads like sea urchin snowman! We went seine netting along the grass flats and found juvenile barracudas, pipefish, pink shrimp, grass shrimp, filefish, sharp-nosed puffers and loads of other different species of grunts, snappers, mojarras and other fish. I know the group liked finding the striped burrfish and juvenile long-spined burrfish the best!!! Nice find!!! Davina with a striped burfish! Later in the week, we went to a few of my secret spots and found some big lobsters under ledges, caught some nice groupers, snappers and grunts on our fishing day, chased big blue crabs around the flats, found cushion, 9 armed and beaded starfish galore, caught a cool juvenile atlantic yellow ray that had no barb, and had FUN watching as 2 friendly manatees hung right below our boat!!! It was just awesome!!! What a great week we had!!! What non-stop adventure fun!!! Wish you all could have joined us!!! We had a blast!!! I’ll let some of my favorite pictures do the rest of the talking!!! Enjoy!!! 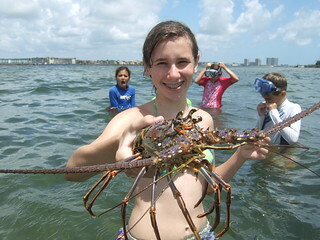 Julia with a BIG lobster! 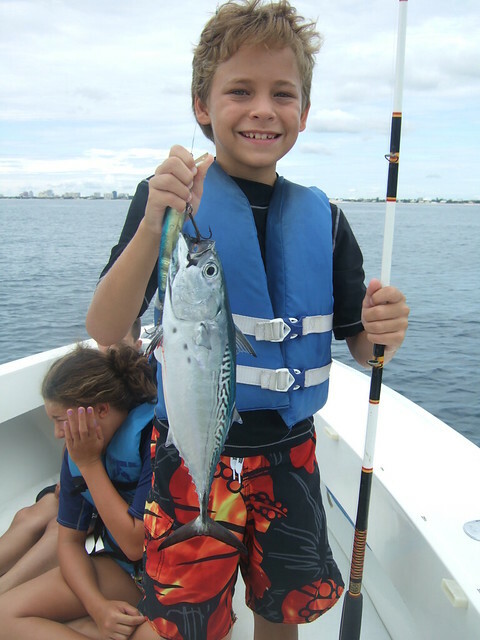 Max with a barracuda. My, what nice teeth you have! 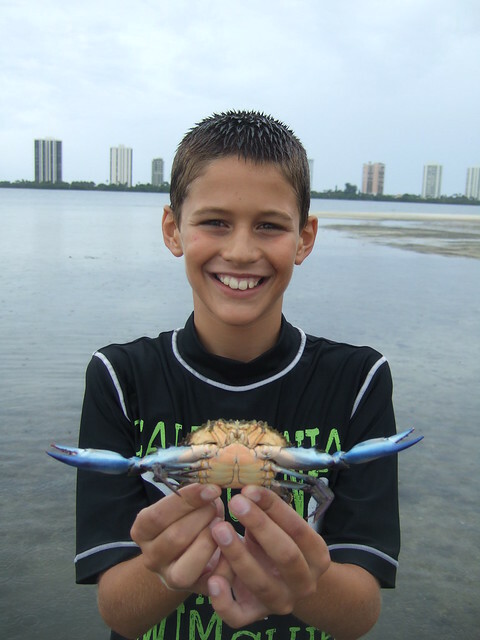 Michael catches another blue crab! 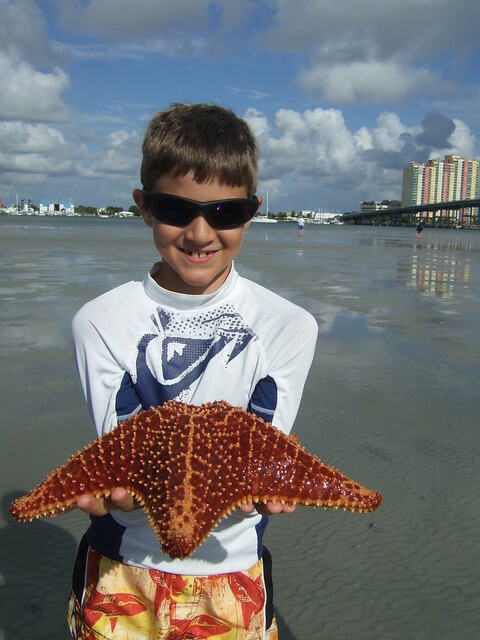 Connor with a cushion starfish. 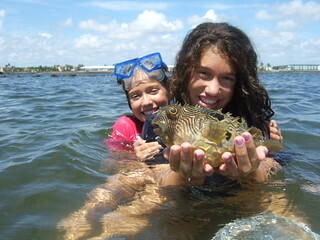 Michaela with a long-spined burrfish. 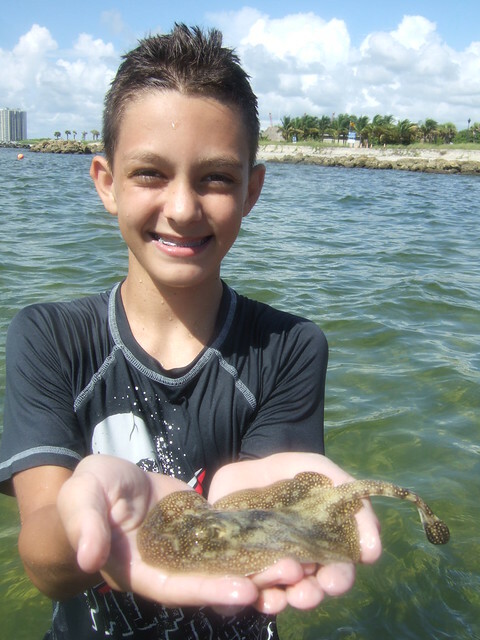 Grayton with a barbless atlantic yellow ray. 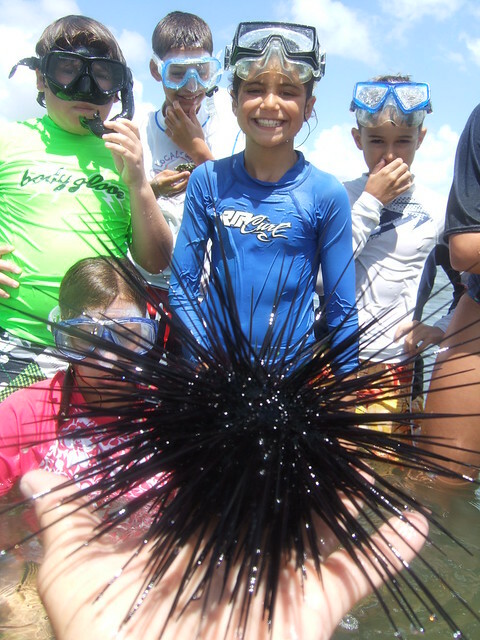 Checking out a long-spined urchin. Best not to try at home! 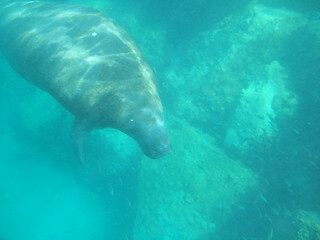 Friendly manatee right under the boat! To check out the rest of the photos from this weeks session, please click on “Check out our FLICKR photostream” found a little bit down on this home page on the right side and go to “July 10 – 13, 2012 AM session”. Let’s Go Have Some Fun!! !